« Would Stockton plan avoid Vallejo-like deficit? Retiree health: bigger budget bite than pensions? The rapidly growing cost of state worker retiree health care, a more generous benefit than received by active state workers, soon could be taking a bigger bite out of the state general fund than pensions. As if trading places, a new forecast expects the annual general fund payment for state worker retiree health care, now $500 million less than the payment for pensions, to be $500 million more than the pension payment in six years. A forecast from the nonpartisan Legislative Analyst’s Office last month projects that a $2.3 billion general fund pension payment to CalPERS this fiscal year will grow to $2.8 billion in fiscal 2019-20. State general fund spending on retiree health care for state workers, $1.8 billion this fiscal year, is projected to grow more than 10 percent a year during the same forecast period, nearly doubling to $3.3 billion. Governor Brown’s 12-point pension reform plan in October 2011 mentioned “the anomaly of retirees paying less for health care premiums than current employees.” But pension reform legislation that took effect last Jan. 1 does not include retiree health care. State worker retiree health care pays 100 percent of the premium of the retiree (the average cost of several of the largest health plans) and 90 percent of the premium for dependents. Active workers and retirees both had the “100/90” health benefit before a cost-cutting change made in 1991 under the administration of former Gov. Pete Wilson required active workers to begin paying some of the cost of their health care. The Legislative Analyst’s projections of CalPERS costs makes several assumptions: investments will hit the 7.5 percent earnings target, no pay increases beyond current contracts and CSU will pay some increased pension costs. State general fund spending, about $100 billion this fiscal year, pays for schools, health, welfare, higher education and other programs. Nearly all of the retiree health care payment comes from the general fund. Spending from various special funds, about $42 billion, pushes the overall state payment to the California Public Employees Retirement System this fiscal year well beyond the $2.3 billion from the general fund to a total of $3.8 billion. Often referred to under a bureaucratic label that cloaks its identity, “Other Post-Employment Benefits,” retiree health care moved into the spotlight last decade when new accounting standards directed governments to begin calculating and reporting the debt. Now the estimated debt or “unfunded liability” for retiree health care promised current state workers over the next three decades is by one measure about 40 percent larger than the CalPERS unfunded liability for state worker pensions. The retiree health care unfunded liability for state workers is $63.8 billion, state Controller John Chiang reported last February. 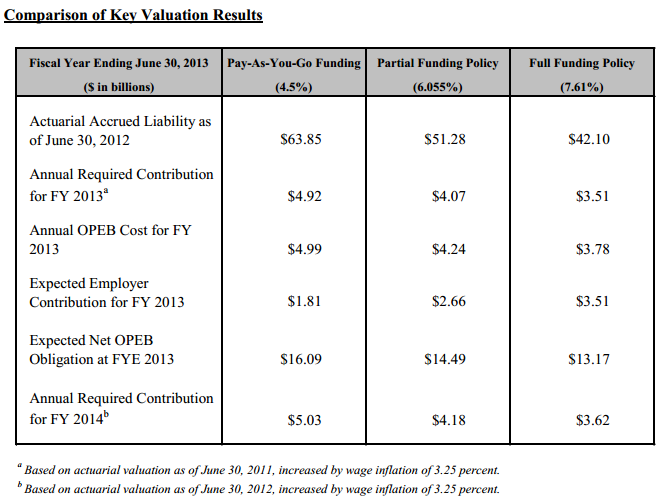 The unfunded liability for state worker pensions is $45.5 billion, according to a CalPERS actuarial valuation as of June 30 last year. State retiree health care is “pay as you go,” with little money set aside to invest and help pay or “pre-fund” future pensions. Pre-funding can lower long-term costs and avoid or reduce debt passed to future generations for services they did not receive. “The current pay-as-we-go model of funding retiree health benefits is short-sighted and a recipe for undermining the fiscal health of future generations of Californians,” Chiang said in a news release last February. Because state retiree health care is “pay as you go,” the controller’s report uses a borrowing cost, 4.5 percent a year, to offset or discount future pension obligations, rather than the earnings-based CalPERS discount rate of 7.5 percent. But even with a 7.61 percent earnings forecast, said the controller’s report, the retiree health care unfunded liability is $42.1 billion, nearly as much as the $45.5 billion pension debt. Two decades ago, legislation by former Assemblyman Dave Elder, D-Long Beach, created a state worker retiree health care fund. But the Legislature chose not to put money in the fund. The controller’s report estimates that the state would have to pay an additional $3 billion this fiscal year to begin fully funding the retiree health care promised current workers. State workers contribute toward their pensions, 8 to 11 percent of pay, and employers contribute 21 to 35 percent of pay. Now several state worker unions are beginning to make contributions to their retiree health care. The Highway Patrol redirected a 2 percent of pay retiree health care contribution to pensions in 2010 during the budget squeeze. Part of a Highway Patrol pay raise last July, 1.9 percent, was directed to retiree health care, triggering a state match in 2015. Bargaining units representing operating engineers and physicians and dentists agreed to begin contributing 0.5 percent of pay to retiree health care last July. Three bargaining units have not yet agreed to new contracts. Can retiree health care be cut or is it protected like pensions? A widely held view is that courts have ruled the pension promised at hire becomes a “vested right,“ protected by contract law, that can only be cut if offset by a new benefit of equal value. A state Supreme Court ruling in an Orange County suit in 2011 said that governments can create an “implied contract” for retiree health care, even if not specifically stated by an ordinance or resolution. Two rulings in September: A superior court judge overturned a freeze on retiree health care for Los Angeles city attorneys, finding an implied contract. A federal judge tossed a suit to overturn Sacramento County retiree health care cuts, finding no contract. While projecting a future surplus in the state general fund, the Legislative Analyst’s report suggests using some of the money to reduce the unfunded liabilities of state worker retiree health care, UC pensions and the California State Teachers Retirement System. An additional $500 million each year would provide $3 billion a year for these debts by fiscal 2019-20. “Even if the state provides this added annual funding, additional payments from other units of government and public employees — or other policy changes — would be required to address these unfunded retirement obligations over the next three decades or so,” said the Legislative Analyst’s report. This entry was posted on December 2, 2013 at 8:17 am and is filed under Retiree health. You can follow any responses to this entry through the RSS 2.0 feed. You can skip to the end and leave a response. Pinging is currently not allowed. When I was still Director of Finance, I testified before Parsky’s OPEB committee. Schwarzenegger said in forming the commission that any change in benefits was off the table. As often happened in that administration, that position was solidified and publicized without input from Finance. So, when I testified, I decided to go a little rogue. State lawyers had unanimously assured us that there was no way to break the 100/90 OPEB benefit. While some private lawyers told me they thought that was self-serving and wrong, I was bound to adhere to the interpretation of the official lawyers. Nevertheless, I found a way that the costs of retiree health care could be, not just reduced, but eliminated. The 100/90 rule is applied to the average cost of active workers’ plans. I pointed out to the committee that if the state simply stopped covering active workers, the 100/90 rule would come down to 100% and 90% of zero, thereby eliminating the costs to the state without changing the basic entitlement. Retirees would simply be entitled to the formula, but it would now yield a value of zero! The first objection to this is that active employees would demand taxable and PERS’able salary increases to offset the elimination of their health care benefit. My answer was that the costs of that would be less than the UAAL on retiree health. Plus, I found a way to keep that from raising the pension liabilities of current employees, increasing their tax burden or changing their health benefit. How? Simply allow the state to continue acting as a broker, but not a payor of group insurance. Then authorize an HSA and with a state contribution into it in the same amount as the current health care state contribution. This would shield that increment from becoming taxable, thereby making it more efficient than a pure salary increase. It would also shield that increment from being considered in the PERS calculation. And, it would fully fund the status quo ante level of health care. Voila! There you have it, no more retiree health care cost, no OPEB UAAL, no increase in state salary and benefit costs, no impact on the PERS UUAL and no reduction in active workers’ health care! It’s hard to imagine who wouldn’t love that. Oh, except my wife now that we receive state-funded OPEB! See what knots these crazy, no-recourse, ultra-long term commitments make state fiscal authorities tie themselves into? When Gov. Jerry Brown rolled out his 12 point plan to reform pensions, I believe he also stated that employees should be moved to Medicare when eligible (65). Taxpayers are funding 50% of the employee Medicare contributions so shouldn’t that be required? We are on Medicare now. It’s never been clear to me whether some retirees who reach 65 years of age duck out of Medicare somehow. I initiated my application and went onto it as soon as eligible. It costs me $353 per month due to my higher income, but I certainly do not complain about that. I hope CalPERS has been aggressive in forcing people onto Medicare because it does save the state some money. Retiree health care is a negotiable item in the CB process with active employees–unlike pension formulas. When I was an active municipal employee I went from anticipation of receiving a full medical benefit, in retirement, to anticipation of receiving a portion of my full premium cost–which today is a mere stipend toward that total premium cost. It happened by the stroke of a few pens in about five minutes. My own reps had signed the previously agreed-upon full benefit away in exchange for a cafeteria plan. My employer never offered miscellaneous rank and file, as I was, dependent health coverage, in retirement. All this boils down to, is the fact that control of costs, in the realm of retiree-health care, is dependent upon, respective, financial situations in the various public sector entities. All those entities should be left alone to sort out specifics and do what is viable in their, respective, situations. No breast-beating about unfunded retiree health care is necessary. MG, you should know better than I, but I was given to understand that all public employees in CA are required to go on Medicare by age 65. If they have no SS coverage from previous or additional employment in the private sector, to render them eligible, they must pay both the Part A and Part B premiums. I was at least fortunate to be the dependent-spouse of a SS recipient, to cover my Part A premium. I send my former municipal employer a check every month, in the amount of $1409.00, to cover our, out-of-pocket cost of, medical insurance premiums which are only secondary to Medicare( Medicare Part B premiums are extra). And, my secondary insurance premiums are higher than those for the active employees who are under age 65. That should make all the detractors happy! @IBEW, You can enroll in whatever health care plan you want, but you will pay heavily for it, if you don’t want Medicare. Most health plans require that you have Medicare first, because it is not going to pick up your costs as though it were a primary carrier. I recall that we looked into the retiree/Medicare issue during the time of the OPEB commission. At that time, we learned that there were quite a few retirees old enough for Medicare, but not enrolled. One of the initiatives we discussed was pushing harder on that, but I don’t recall whether anything actually happened with it. I do think, in response to IBEW, that either we got that law in at that time, or we just asked CalPERS to improve its enforcement. But, to be clear the rule you cite only applies to CalPERS retirees, not muni’s or the public. Of course, most firms and many municipalities are better and more frugally managed than the State of California. As to SeeSaw’s comment about no breast beating, I don’t see that. The article notes the rather astonishing fact that for state employees/retires OPEB costs are about to exceed pension costs. That is a significant fiscal issue for the state and drawing attention to it is, hopefully, the first step toward addressing it. As a State Misc Member I was required to sign up for Medicare upon reaching age 65, and informed repeatedly that failure to enroll in a timely fashion would result in cancellation of my Pers Choice insurance. What I found highly odd is that the State reimburses us both for the monthly Medicare payments my spouse and I pay PLUS the surcharge payment because our income is over the threshold amount. This shows up as a credit on our monthly retirement check from PERS. I thought we were talking about calpers retirees, sorry I didn’t clarify that but I think the link I provided was pretty clear that it wasn’t private employees and it does refer to a law that dictates that calpers retirees cannot stay in regular health plans if they are medicare eligible. They can stay in the regular health plans, IBEW, but those regular health plans no longer act as primary insurers. I am in the same plan with my former employer that I was in before I retired, ABC. That health plan was my major insurer and paid all of my covered costs. Now that I am a Medicare beneficiary, ABC becomes the secondary insurer. The premiums are more than they were before I retired, and the coverage is very minimal. I’m not going to argue with you, all I can tell you is that I was inundated with letters from Calpers before I turned 65 warning me that I needed to enroll in medicare and pick a medicare supplement plan, that my current insurance would no longer provide coverage. “Contrary to current practice, rules requiring all retirees to look to Medicare to the fullest extent possible when they become eligible will be fully enforced. It appears, based on that statement, that enforcement at the state level was lacking, and enforcement on the local levels may not exist. Who is responsible for ensuring compliance? I have seen some local employee contracts that include the Medicare language, but many more that do not. For the state, the enforcement is CalPERS’s responsibility. I’ll try to find out what they’re doing and whether they’ve stepped it up either in response to Schwarzenegger or Brown. For locals, I think it must be all over the map. Sadly, Stockton just wiped out retiree health care altogether. As with pension reform, retiree health care reform should aim to cut public costs substantially, but not go the Draconian extent that happens when things get so bad that bankruptcy seems to be the only answer. I’m a local agency retiree, but the agency I worked for never has had anything to do with CalPERS medical plans, that has all gone through CalPERS and as I said, I got plenty of stern warnings about signing up for medicare and choosing a medicare plan. Do other local agencies handle CalPERS medical differently? Mike, you’ll have to excuse me, but I find that statement very scary. I could provide a long list, a laundry list if you will, of reasons why CalPERS oversight of anything is suspect at best. Nevertheless, I look forward to reading your findings. Thank you for your insight into the GAS Administration Mr. Genest. Just goes to show you we don’t need anymore bad actors running our state. We also don’t need anymore private sector fools claiming they will run the state like a business. Nobody runs their business like GAS did unless they are bankrupting it. Oh wait…that happened. See how our state was purposefully bankrupted. This is a classic ruse of creating a crisis and assigning the blame to your designated scape goat…in this case…pensions. If the Bankruptcy Judge in the San Bernadino case reduces the workers/retirees pensions (via erasing all or a part of what San Bernadino owes CalPERS….for past or future service), will that still be a “created crisis?